Skål (Skoal): a Scandinavian toast. For the proper pronunciation, see here. Akvavit (Aquavit): a Scandinavian distilled liquor usually flavored with caraway. The photos appeared in “The Cooking of Scandinavia,” one of the books in the amazing Time Life series Foods of the World. The shooter was none other than Richard A. Meek, one of the original roster of Sports Illustrated photographers. Max is such a badass. You can learn a lot about people by how they handle a simple ritual like skoaling. The ritual is rigid, set in stone and unvarying. The art of the skoal discovers the person behind the toast by differences they bring to such a rigid format. With the skoal, like a symphony or a sonata, it’s the structure itself that allows for the art. Collect a database of skoal shots from a wide variety of people: friends, family, chefs, artists, actors, writers, musicians, politicians, magnates—anyone of general cultural import or import to us. As we get the photos we’ll share them with you. Eventually we hope to make a book. 1. Skoaling is serious business. Don’t be goofy; don’t smile like it’s prom night. On the other hand, there is no reason to be morose or look like a psycho. Remember: You are sharing a drink–and a little bit of yourself—with the viewer. 3. Don’t try to be Max. Only Max is Max. Be yourself. We want to learn about you, not your ability to do an impression. 4. Try to look nice. See rule 1. 5. Remember to hold the glass in the right position. Remember to knock the drink all the way back. Remember to bring the glass back to its initial position. One of the more important cultural rituals in Sweden is the drinking of the snaps, at least if you are old enough to drink… or not. Snaps is a glass of, hopefully, ice cold aquavit. We take our drinking very seriously in Sweden, and no drinking is more serious the downing of a snaps. 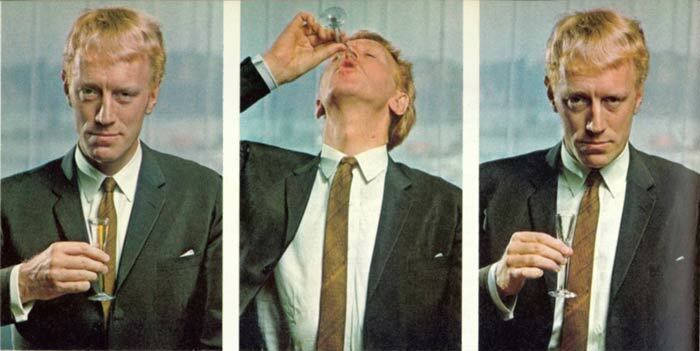 A snaps is not something that one nurses and sips on; it can, however, be divided up in either two, three, or four skåls (skål being the act of raising your glass with your fellow companions in the same manner that is so expertly illustrated by Max von Sydow). But dividing it into three or four skåls is nothing I would recommend. No Swedish feast (think Easter, Christmas, or the many others too numerous to mention) is legitimate without a glass of snaps present. So that means if you ever encounter a Swede that does not know how to do a proper skål, it’s not a legitimate Swede.